For months on end, during one winter in the early 1920s, a young man lay at night on a bed in the croglofft of a primitive and dilapidated cottage near the end of the Llyn Peninsula, writing an extraordinary poem by candlelight, as his wife and infant daughter slept downstairs. Although the writer was only 21, his verse shows an assured handling of rhyme and rhythm, as well as an imaginative grasp of metaphor, as the opening lines of the poem illustrate. No doubt the young man was proud of "Anadyomene". As it means literally "sprung from the waves" and is an adjective applied to Aphrodite, goddess of beauty, fertility and sexual love and as he was writing near and about the sea, in the company of his beautiful young wife and daughter, he may be forgiven for showing off his classical learning. By the time he had finished, the poem consisted of about 1,500 lines of verse which, although containing clear echoes of earlier poets (as one would expect in the first work of a young writer), was quite unlike anything else being written at that time. When it was published in May 1924 it received critical acclaim from some of the established literary figures of the day, including T.E.Lawrence, who thought it "great stuff", and in a letter to his publisher wrote, "...what originality, what energy, what freshness and enthusiasm, and what a riot of glorious imagery and colour! Magnificent I call it!". The Spectator said in a review that the poem "...stands like a giant among the bagatelles and delicacies of most modern poets." Neither was it a nine days' wonder: half a century later, The Dictionary of National Biography described it as "...a humanistic allegory on the rejuvenation of man, projected in episodes and images of such flamboyant splendour that the work justly made him famous.". He was certainly a fine, tall young fellow with a careless buccaneer air about him... Roy had large misty eyes, directed, I noticed, quite frequently towards the tall rococo mirrors of the Café [Royal], in which, given a favourable angle, one saw oneself reflected to some advantage...". When I saw her I experienced, for one of the few times in my life, the electric thrill of falling in love at first sight. But she is the only woman for whom I have felt this Dantesque sensation several times; when coming back on leave from active service, or after other separations abroad. She is also the only woman with whom I have found that jealousy or quarrels have mutually acted as a kind of aphrodisiac. I thought of nothing but of living and working for this woman (whom I knew to be mine, "for better or worse", the minute I saw her). The Garmans' father was a doctor in Wednesbury, near Birmingham, and Mary and her sister were escaping from what they thought of as stuffy provincial respectability. (There was, however, something unconventional and romantic in her background, as her mother was the illegitimate daughter of Viscount Grey of Falloden, the man who memorably summed up a significant moment in European history by saying in August 1914, "The lights are going out all over Europe...".) Mary and Kathleen were attractive girls, and soon after moving to London had a string of artists as admirers, the most famous of whom was Jacob Epstein (who, many years later, was to marry Kathleen). Campbell himself was a handsome man, over six feet tall, and within three days of meeting Mary, had moved in to live with the two girls in their flat near Regent Square, much to the annoyance of their artist friends. This annoyance led on one occasion to Epstein and Campbell actually fighting; writing about it later, Campbell turned the incident into a battle of epic proportions, but as it was Kathleen who actually separated the combatants, it could well have been nothing more than a scuffle. No woman will ever forgive a husband who does not give her a thoroughly good hiding when she knows she has deserved one. On the contrary, she will hate and despise him, and make a fool of him at every turn and corner, if he does not behave like a man. They soon began to find it difficult to live on the few reviewing jobs which Campbell had managed to get, and they had to pawn their wedding presents. To find somewhere cheaper (and perhaps to escape from Epstein who was still making things difficult) they decided to move to Aberdaron, a place which Mary knew well as she had spent childhood holidays there with her parents (together with her six sisters and two brothers). They slept rough for a while, but eventually managed to rent the dilapidated cottage of Ty Corn, near Pencaerau and nearly four miles from Aberdaron. It has been described as "a cowshed" and "a stable", but as it had a sash window and a chimney (as the name suggests), it must originally have been a dwelling house. (In 1891 the widowed Richard Thomas, a "Carrier of Butter and Eggs", aged 53 and his 15-year old daughter Eliza lived there.) It was certainly a cottage of the very smallest type and does appear to have provided a separate part for animals at one end. The croglofft the poet wrote in had a tiny glass pane set in the roof. 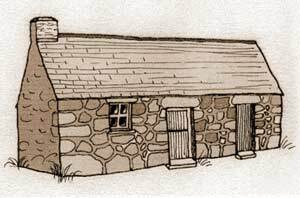 Conditions there were certainly primitive, as we can learn from an independent account, written by Augustus John's 17-year old son Romilly, who was visiting the Campbells when they moved into Ty Corn. He stayed about a month, and wrote about it some years later. I shall never forget the day we moved in or the dismay with which I first contemplated the hovel we were about to inhabit. The floor was earth stamped unevenly down, and in some places the mud had fallen from between the rocks of which the walls were built, so that the wind came whistling in. Mary and I both fell a prey to unspeakable gloom - I believe Mary even shed some natural tears. But it was astonishing how quickly we cheered up under the influence of Roy's indomitable spirit. I really think it had never crossed his mind that the cottage in any way fell short of a desirable country residence; nor did it, when the holes had been stuffed up and a great fire was roaring up the chimney. At one end of the kitchen there was an old bedstead in the last stages of decrepitude; this was occupied by Roy and Mary while I slept upstairs in a kind of dark loft. We had not been installed more than a day or two when an ancient man called on us and began pouring out a flood of eloquence, unfortunately in the Welsh tongue. After some lively pantomime we made out that he was a former tenant of the cottage, that the old bedstead belonged to him, and he had come to take it away. With much difficulty we persuaded him to relinquish his claim, and he departed muttering. The neighbours, who had taken a liking to Roy and made him frequent presents of apples and potatoes, afterwards told us that this old man was quite mad. Romilly John, who had agreed to help Mary with the housework, gives us a few more details about the Campbells' stay in Aberdaron. Roy was writing a good deal, and apart from my household tasks I had not much to do. Once I bathed with him on the fringe of an enormous sea, each wave threatening to draw us out into mid-ocean, or to batter us to death on the large stones of which the beach was composed. This proved a little too exciting and we soon gave it up. We used frequently to go shooting in the evenings. There were literally millions of rabbits in the fields, but I do not remember that we ever got one. There was something wrong with the gun, I think. The reference to the large stones on the beach suggests that they bathed at Porth Ysgo, the nearest beach to Ty Corn. The rabbit shooting sounds rather different in the account Campbell himself gave of it; writing about 10 years later he said, "...I bought a small gun second-hand, which kept us in food." After another two decades, he added a few details: "I bought a small shotgun for twenty-two shillings from Gamage's, melted the shot into ball cartridges, and found it quite handy. The poaching was excellent....". By this time Mary was pregnant, and a daughter was born in November 1922. Peter Alexander, Campbell's biographer, who was able to consult Mary towards the end of her life, gives an account of it. ...Teresa was delivered during a violent storm by a young midwife, by the light of a single oil-lamp that swung crazily from the rafters as the wind rose. Campbell, unable to be present, sheltered behind a piece of corrugated iron on the beach, and suffered fearful sympathetic pain. At dawn, as the storm abated, he went out and shot a snipe, and grilled it on a spit for Mary's breakfast. ...Teresa was born on the night of a terrible mid-winter storm. I have not seen anything to equal the extraordinary courage of my wife in fighting through this fearful night, when the wind blew the tiles off our roof and the rain and wind rushed in headlong. The doctor arrived about seven hours after it was necessary and swallowed up our last five pounds. Campbell wrote an account of his stay in Llyn in his two volumes of autobiography (both of which are long out of print). The first version occurs in Broken Record (1934) and is as follows. ....Augustus John then sent us down to his farm in Dorset where we spent a grand Christmas, after which we cleared off, as we were sick of city life, to a corner of Wales, of which my wife was very fond. We rented a stable for three pounds a year which, with the help of Romilly John, who visited us on foot from Dorset, we converted into a cottage and where we lived for two years. Twenty miles from the railway terminus of Pwllheli we were just opposite the island of Bardsey. It was a fairly hard life; for lack of fuel I had to carry a hundred-weight of coal two miles from the road every week, and, though used to carrying heavier buck, I found it difficult to manage these dead weights. We lived at first on about five pounds a month, spending half of it on books, for I had soon the whole country set with traps and springes, and bought a small gun second-hand, which kept us in food. For vegetables I toured the whole district at night. Over the fire we read Dante, Pope's Homer, Dryden's Virgil, Paradise Lost, Donne, Mickle's Camoëns, Cervantes, Rabelais, and the Elizabethans; living for a year under the continual intoxication of poetry. The island was then under the reign of my late friend, Love Pritchard, who took to us very much - to my wife for her beauty, and to me because I forced a cowardly doctor to cross over during a storm to a bad confinement on the island, and also helped them to get the right motor for their prehistoric galley. The island is now deserted, but there were seventy inhabitants when we went there, and they never came ashore (sometimes they would be held up seven weeks at a time by the current) without bringing us half a dozen mixed fowls, rabbits, crabs and lobsters. They called me "Africa": few of them could speak a word of English. Most wore earrings and beards, and Aberdaron was their nearest port on the mainland. We lived a good deal on rabbits, but I soon got in well with the fishermen and found some queer ways of earning money. On the Mynidd [sic] Mawr there were wild goats (rather, tame goats gone wild) and I used to shoot and sell these to the local butcher. I shot two seals, lopped off their flippers, brayed their skins and sold them to tourists for motoring coats, though they were not strictly "fur-bearing" seals, and the coats would moult in a month or so. I wrote letters for the peasants and became Love's chief adviser concerning his home policy: and cheating the tax-collector. Love was about eighty then. He could pick up a sack of flour with one hand and lay it over his shoulder as if it were a feather. I heard from him, rather through him (for he couldn't write) several times since then, in Africa: until I saw the announcement of his sudden death, and saw that the islanders had left; which I think is silly of them. Now the first thing anyone who studies the life of Campbell realizes is that he was completely unreliable as to facts. Numerous stories in his autobiographies reveal him to be a fantasist, anxious to tell stories which show how recklessly brave he was, and there can be no doubt that his story about taking a reluctant doctor over to Bardsey comes into this category. By the time he came to write his second volume of autobiography about 15 years after the first, he added a few more details, none of which would convince anyone who knows anything about the passage across the Sound to Bardsey. I was, I believe, the only Saesnag, or foreigner, that was ever persona grata with the islanders. This was because when a doctor, who was staying in one of the hotels on the mainland, had refused to go over to a difficult confinement case on a stormy night, I stayed up drinking with him late at night, and when he had passed out, carried him off, popped him into a boat, borrowed from one of the other guests, and took him over myself, in very difficult weather. When he woke up on the island, I kidded him that he was a hero and had insisted on being brought over. But the islanders and the fishermen knew who had brought him, since few would have dared to sail in the weather that blew up at 4 a.m. The oral history of the island in the first decades of the twentieth century is remarkably well recorded, and one of the stories concerns a doctor who was called to the island and, after attending to his patient, set out on his journey back at five o'clock in the evening, but did not reach Aberdaron until three o'clock the following morning, after which he vowed never to go back even if all the islanders were unwell. It sounds as if Campbell was told this story, and decided to adapt it to his own use. Anyone reading his volumes of autobiography must tread carefully, selecting what to believe and what not, and there is no evidence that the writer ever visited Bardsey. In the mid 1920s (a few years before Campbell wrote his first account of the stay in Pencaerau), Love Pritchard and some other islanders did leave in September 1925, and there was publicity in the national press about what was called the "exodus". In fact, however, many families stayed on, and at the end of the decade, far from being "deserted" the island had between 30 and 40 people still living there. Whether or not the Bardsey islanders should pay Income Tax was often discussed, and Campbell must have been told something about this. His reference to their "ancient galley" is also based on something he probably heard; they often had difficulties with the motor boat they used in the 1920s, and at the time the Campbells were in Aberdaron a young schoolmistress had to be rowed over, in quite rough seas. Is (love forgive us!) cinders, ashes, dust. but I think we were as happy at Ty Corn as we are today, here in Kensington, with all the comforts of civilization, nearly thirty years afterwards. [He tells the story of taking the reluctant doctor over to Bardsey] The fishermen of the island (who were almost savages and wore ear-rings and beards) never forgot this: and every time they came ashore in their prehistoric galley they remembered to leave several live lobsters or a lamb or a few dozen eggs at the Ship Hotel or Ty Newydd, for "Africa bach" as they called me. Their King, Love Pritchard, was the only one of the islanders who could speak a word of English. He was about eighty, but he was a very fine specimen and could pick up a sack of coal as if he were a young man. By the time we left we had quite a farm with chickens, sheep, and a good vegetable garden. Not only that, but we had read aloud to each other the whole of Milton, Marlowe, Shakespeare, Dryden, Pope and many of the Elizabethans. Campbell is probably right when he says the locals gave them presents, especially when we remember that they were obviously penniless and Mary was pregnant. There is a farmhouse (Ty Canol) a few yards from Ty Corn, and Mary Ann, the woman who lived there at that time, befriended Mary Campbell and was a considerable help to her after Teresa was born, even washing nappies for her. Campbell is less reliable about the Bardsey islanders, as he wanted to romanticise them. Although all 63 islanders in 1891 declared that they were monoglot Welsh, it is possible that by the 1920s they spoke English better than some of the locals on the mainland, as for generations Bardsey children had played with the children of the English lighthouse keepers. Even in the nineteenth century, the Calvinistic Methodist minister on the island sometimes preached in English so that the lighthouse families could understand his sermons. A Welsh newspaper, issued at the time of which Campbell was writing, tells us that of the 58 people living on the island, only 11 of them were monoglot Welsh speakers. ...had a fear of illiteracy, which I do not share, having met, among Spanish peasants who could not read, the most happy, cultured, brave and dignified people on earth, far more intelligent than most professors. It is doubtful that the islanders were more likely to be illiterate than the general population; there were times in the nineteenth century, for example, when the minister, who also acted as a schoolteacher, held evening classes for 15 adults. There was, in fact, nothing really primitive about life on the island at this time; the houses and farm buildings, for example, were of better quality than most on the mainland, and the islanders had for years been used to entertaining visitors during summer months. The recollections of the islanders who lived there during the first decades of the twentieth century all emphasise that they ate well. Love Pritchard was born in 1843, and died in April 1926, a few months after leaving the island. The obituaries published in the local papers confirm what Campbell says about his impressive physique. That in Yr Herald Cymraeg said of him, "...er ei fod yn cario pwysau pedwar ugain mlynedd ar eu ysgwyddau gallai dynnu'r rhwyfau wrth ochr y dynion ieuengaf yn yr ynys." ( ... even when he carried the weight of eighty years on his shoulders he could row alongside the youngest of the islandmen.) All the men had all been used to rowing across the Sound regularly, a journey that could take up to two hours, and another obituarist claimed that in his lifetime Love Pritchard had crossed Bardsey Sound by rowing boat over 5,000 times. Campbell's opinion of the islanders was one common at that time, apparently; one of the obituaries claims that London journalists took an interest in the islanders, some thinking of them as half savages, and others looking on them as exceptionally wise people. It tells us something about Campbell, however, that he should see Love Pritchard ("the last King of Bardsey") as a romantic figure; other more cynical observers have pointed out that the post of King was given to an islander in order to help the landowner, Lord Newborough, collect his rents. Campbell's reference to his "good vegetable garden" contrasts with his story of touring the district at night for vegetables. It may be that the earlier version is true, as he was quite capable of allowing one swede, taken surreptitiously from a field, to give him a story to illustrate what a daring young fellow he was. I am not taken in by these purely literary exercises in bombast. I suspect this affectation of gigantic strength and ruthless courage. Vain as an exhibitionist child, he looks for applause as he stretches out his hands for the baubles allotted to the prettiest, cleverest and bravest little man in the nursery. What caused this serious flaw in his personality is open to speculation. We may, however, get a hint from the fact that his father was academically brilliant and an impressive athlete, and that his four brothers (according to his biographer) "...loved nothing better than violent physical activity." It is possible that an early feeling of inadequacy caused him to spend the rest of his adult life claiming to live up to their example. Curiously enough, he seems to have been quite diffident about the quality of his verse, and his comments about that show little of the ludicrous boasting for which his prose writings have become notorious. The Flaming Terrapin, the poem he wrote during his stay in Llyn, is remarkable enough, especially as the first published work of a young man. Although it contains clear echoes of the reading he mentions (especially Milton), it remains an original piece of work. In technique, it shows none of the modernism of The Waste Land, published while Campbell's poem was being written, but neither has it any of that better-known and more influential poem's allusiveness and obscurity (although it presents its own problems). We may look in vain for clear references to the place in which the poem was written, but there is a passage near the beginning in which the writer might be thought to be looking across the Irish Sea, as anyone walking out of the door of Ty Corn must. To shake the golden bonfire of her hair. Like Ariel on the empty winds to spin). Part II of the poem describes the construction and launching of Noah's Ark. Stands with his great fist fastened to the wheel. Creamed on the scattered shingle of the stars. Quite when Campbell hit upon the rather eccentric idea of describing a gigantic terrapin towing Noah's Ark, is not clear, but anyone looking westwards at the outline of Bardsey from the hills above Ty Corn might consider that the island is terrapin-shaped in outline, and that a sunset could well have suggested the adjective "flaming". It would be pointless to labour the point, however, because The Flaming Terrapin is not that sort of poem. With its descriptions of gigantic movements in vast spaces and personification of abstract ideas it is strongly reminiscent of Paradise Lost, (at times almost sounding like a pastiche: "Let old Corruption on his spangled throne / Tremble to hear!") and like its great predecessor, Campbell's poem is a work of the imagination, not observation. An unsympathetic reader of The Flaming Terrapin might point out that the symbolism is so vague that, although the poet uses the spur and the whip all right, we are still in some doubt about where the bloody horse is going. Augustus John's comment about Campbell's poetry generally is one which most readers of the poem would agree with, when he talks of "...interminable effusions, of which the unceasing grandiloquence soon exhausts the reader...". The poem ends with a vision of Noah, of heroic stature, standing "High on the top of Ararat alone..." gazing out towards the horizon and the sunset. Trailing their gorgeous fringes o'er the heights. The Man, clear-cut against the last horizon!" The Campbells were a striking and unconventional pair, and must have impressed the locals. When Peter Alexander visited the area to gather material for his biography of Campbell over half a century after they lived in Pencaerau, he was told stories of the pair making love in the open air, and drawing on the walls of Ty Corn charcoal sketches of themselves naked. 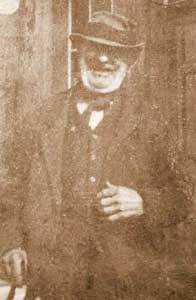 He was also told a story of the coalman calling at the house and being greeted at the door by Mary and her sister Kathleen, both naked. Again, in the late 1980s, their neighbour Mary Ann's cousin, who lived in Pencaerau Farm, which they passed on their way to and from Aberdaron, remembered in response to enquiry that they wore capes and hats to match and that conditions in Ty Corn were quite primitive: "Roeddynt yn byw ddigon di drefn heb lawer o ddodrefn ond gwely a boxes." (They lived in a rather disorderly way, without much furniture except a bed and boxes.). Mary Campbell herself told the biographer that they were "...the first hippies." Although it was very difficult to acquire literary fame without kowtowing to the homosexual and yiddish freemasonries, I knew that I could eventually pierce through any screen they tried to set up between me and the public. His obvious anti-Semitism and the sheer spite he sometimes showed towards left-wingers are difficulties modern readers are bound to face in Campbell's prose. There are times in his memoirs when his language reveals a sort of unbalance. To take one example: he was in Spain during the unrest that preceded the Spanish Civil War, and he describes one incident from that time, in which he discovered some Republicans and Germans ("mostly Jews") interrupting a church service. Crying on Saint Louis, I caught the biggest one, Dr. Meyerstein, and brought him out into the square where I broke his glasses and watch, and then throttled out his false teeth and broke them to pieces too. He liked to give the impression that he fought for the Falangists in the Spanish Civil War, but in actual fact he did nothing more than tour for one day near the fighting, armed with a journalist's pass, and the quite serious injury he sustained at about that time was caused by an accidental fall. He could, however, be said to have fought against fascism, enlisting first as a private in the Royal Welsh Fusiliers in April 1941, training with them near Brecon, and spending some time at a place called Cwm Gwdi. It was during his time there that he started on a series of translations of the poems of the mystic St John of the Cross (Juan de Yepes y Álvarez, 1542-1591), which are considered by some to be his finest achievement as a poet; perhaps the best known of these is Upon a Gloomy Night, his version of En la Noche Oscura. The Campbells had (at Mary's suggestion) converted to Roman Catholicism in the 1930s. Campbell served in the army until being invalided out in 1944, and for some years after that worked for the BBC; it was during this time that he was responsible as Producer for a number of the Third Programme talks given by Dylan Thomas, and the two became friendly. Perhaps Campbell remembered his time in Wales, when, one St David's Day in the late 1940s, for a bet during a drinking session, the two poets ate a bunch of daffodils. Years before, Harold Nicolson had told Campbell that he was "another Rimbaud" and, perhaps remembering this, Campbell called Thomas "Swansea's Rimbaud", a phrase which Thomas himself improved to "the Rimbaud of Cwmdonkin Drive". It is tempting to draw a comparison between the two poets: both generously endowed with a gift for words, but both with flawed personalities, neither really growing up. According to his wife, Thomas liked nothing better than sitting in a hot bath eating dolly mixtures, and Campbell knew no better way of settling an argument than by punching his opponent on the nose. In both, their intellectual gifts were not commensurate with their undoubted ability to put words together in a memorable way. Campbell was an individualist, a traditionalist and a fiery scorner of much that was accepted by his articulate contemporaries as being commonplace truth. But to call him a poet of the right is merely to use a convenient label. It does not explain the beauty of his lyrics nor the marvellous sweep of his narrative descriptive power. ... In 1924 The Flaming Terrapin made his name. Here was a poet not afraid of polychromatic imagery and one able to handle it without lapsing into rhetoric, though not always escaping monotony. The South African origins of the writer were plain. He could not have written as he did had he not known the great seas that roar around the Cape. We might add to that at least the possibility of the poet taking some hints in his descriptions of the sea from the rocky coastline of the Llyn Peninsula. The only biography (unlikely to be superseded) is Roy Campbell, A Critical Biography by Peter Alexander (Oxford, 1982). There is also an excellent short introduction to the poet, both as writer and personality in Roy Campbell by David Wright (Longmans, 1961). The Flaming Terrapin was published by Jonathan Cape in 1924, and reprinted in Collected Poems Volume I (The Bodley Head, 1949). The two volumes of autobiography which mention the Campbells' stay near Aberdaron are Broken Record (Boriswood, 1934) and Light on a Dark Horse (Hollis & Carter, 1951; Penguin, 1971). Romilly John's account of his stay in Ty Corn is in his The Seventh Child (Heinemann, 1932). 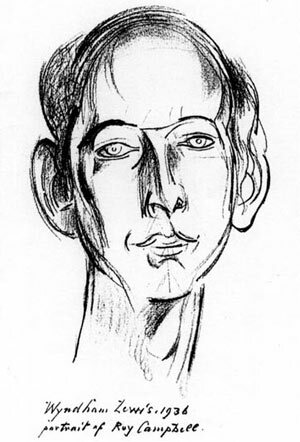 There are a number of memorable appearances by Campbell in memoirs of the 1930s: see especially As I Walked Out One Midsummer Morning by Laurie Lee (André Deutsch, 1969 and 1985), Finishing Touches by Augustus John (Jonathan Cape, 1966) and Blasting and Bombadiering by P. Wyndham Lewis (Eyre and Spottiswood, 1937). He also makes fictionalised appearances in two of Wyndham Lewis's novels: The Apes of God (Nash & Grayson, 1930) and Snooty Baronet (Cassell, 1932). Rhiw.com would like to thank Mr Neale for this brilliant work.